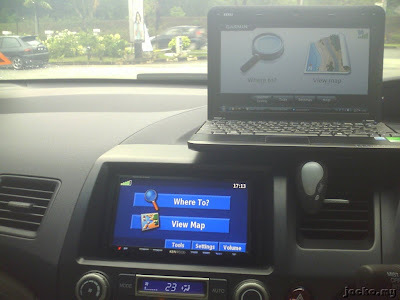 Few years back, I was introduced to a new gadget area, the Global Positioning System or GPS. Many of my friends confuse GPS and GPRS. The common two questions I always get when I show them GPS, "Maxis got ar?" or "Celcom got ar?" and "How much?". In layman term, as its name suggests, GPS tells you your position wherever you are in the globe relative to longitude and latitude coordinates. Nothing fun about GPS if without application. Combining routing and navigation system, that's different story out of it, well, if you are a geek. And, again and again I repeat to my friends, it does not connect you to internet like GPRS. With a Bluetooth GPSr (GPS receiver) paired with my PDA phone loaded with GPS software, Garmin Que and docked on a phone holder. You'd know, it never fails when come to gadget, I got addicted to this GPS thingy :") Err... May be I should say I got lazier to use my brain, to plan my route before I start my journey. 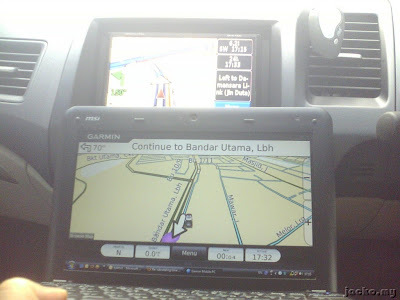 The GPS becomes so dependable for me, especially I work in the jammy KL. During traffic jam, I can just simply detour from my usual route to look for alternatives without getting lost in the city. That sometimes save me time if I manage to get onto a no-car route. 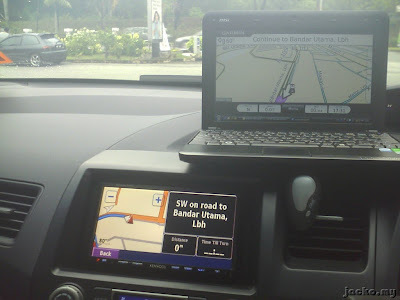 Too bad, unlike US or Europe, there is no traffic info service integration with GPS in this BullehLand, else for sure I can save more petrol and time. 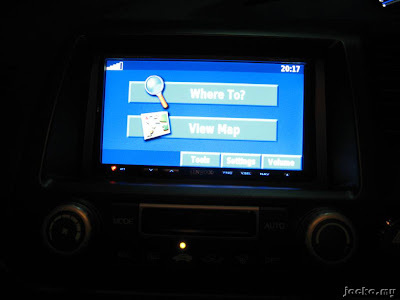 A 7" screen integrated car navigation. Double the screen size of the original setup and 13 times the price I paid for the bluetooth GPSr. Hehe... too much huh? 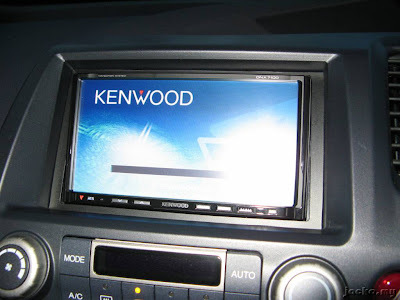 :P It's all-in-one integrated with radio tuner, CD/DVD, photo viewing, MP3/WMV, iPod and of course the GPS. Bigger touch screen with full screen QWERTY keyboard and automatic mute when the navigation system gives directions. With portability and the screen size is 3" bigger than the car navigation system with 10" inch screen on Wind! There are more and more netbooks flooding the market now. Asus Eee PC 1000, HP Mini 1000, Lenovo IdeaPad S10, Dell Mini 9, Acer Aspire One etc etc. Some of their outlook might be appealing, but if you look carefully the specifications, you will still see Wind beats most of them, if not all. Moreover, Santa Claus is sending Wind's sister U120 to town soon! !